The first day of the school year is probably the day the children are looking forward to with the greatest eagerness. They prepare their school bag, the clothes, the uniform if necessary, the new shoes, the wide smiles and they are going to rejoin their colleagues after three months of vacation. They’re all set to have their photo taken. Just because they are so beautiful and happy, Sun Plaza wants to give them a memory from the first day of school. From 11 to 13 September, between 11.00 and 17.00, Cristian Şuţu from www.fotounion.ro will move his studio to Sun Plaza and will take free professional photos of all pupils. In the studio located at the ground floor of the shopping center, close to the main entrance of South Esplanada, the perfect setting for professional photography will be created. All photos taken during the three days will be posted on the Facebook shopping center page. At the same time, 32 children from the “Second Chance” program are invited to participate in this project. These, assisted by the Save the Children Organization, will receive, besides the photo session, a school bag and a set of stationery, as well as a lunch in a restaurant in the shopping center. You too can help these kids! When you come to Sun Plaza to buy school supplies, take some extra for Second Chance children, then leave them at our Info Point (1st floor). Sun Plaza will send them to Save the Children Organization. Beneficiaries are children or young people who have never been enrolled at school or who have abandoned it at some point for various reasons. Now you can give them an extra chance! At national level, in the 2015-2016 school year, more than 13,000 students, of which 3,143 minors, benefited from the “Second Chance” program in almost 300 schools. Subscribe to the newsletter of sensational events! Be the first to know what events we're preparing and make your fun time at Sun Plaza. And because we also do not like spam, you'll be able to unsubscribe at any time, directly from the email you receive. 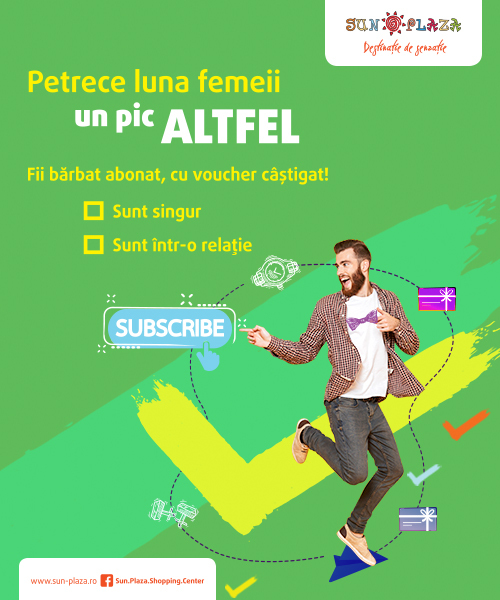 Trimite-ne părerea ta despre site completând formularul pentru păreri clienți. Click here!